Time affects everyone eventually, even the Batman. Even creating a high-tech suit to counter his failing body isn’t enough and he does the unthinkable…for him anyway…when he grabs a gun to protect himself during a kidnap victim rescue. Thus he swears to never be Batman again, locking his new costume in a glass case alongside those of his sidekicks and original costume. 20 years pass, and Bruce Wayne is a shell of his former self. Derek Powers has absorbed Wayne Enterprises into his business, forming Wayne-Powers. The streets are run by a gang who fashioned themselves after the Joker. And a young man named Terry McGinnis finds himself thrust into a dangerous secret at Wayne-Powers when his father is killed. Earlier he found himself fighting the Jokerz alongside an old man, and ended up learning a secret about him. Now he’s the only man Terry can turn to, because he is Bruce Wayne…the man who was Batman! 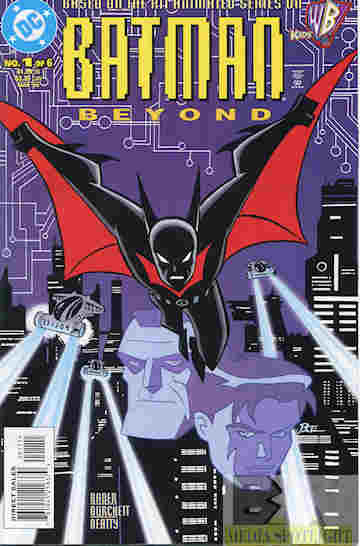 This issue and the next one are adapting “Rebirth”, the two-part pilot of the original TV series and unlike the recent series this is set during the show, like the other DCAU “Adventures” titles. Those of you in I think Europe may actually know the show as Batman Of The Future. What they got right: While a shortened adaptation of the episode it ends right where part one did and gives you the highlights. The art style matches the show like the other DCAU comics. What they got wrong: I don’t know if this is a “deleted scene” or if Bader opted to stick this in to explain Batman’s suit (and push his hatred of guns to the point that a legitimate gunowner gets treated like a jerk by Batman) but for some reason we see Batman with a super-powered arm exo-skeleton for no apparent reason to stop the gunrunners since this scene was modern-day Batman and didn’t suffer the medical problems we see a few years later. The episode doesn’t have this and it didn’t really need it. Recommendation: I very much enjoy the TV series and I do recommend it. The adaptation isn’t bad but I liked it better when the original stories started in issue #3, and later in the ongoing (this is a six issue miniseries). Not a bad addition to the collection if you’re getting the full comic series though. Posted by ShadowWing Tronix on March 24, 2018 in Animation Spotlight, DC Spotlight, Television Spotlight, Yesterday's Comics and tagged Batman, Batman Beyond, Bruce Wayne, DC animated universe, Derek Powers, Kids WB, Terry McGinnis.